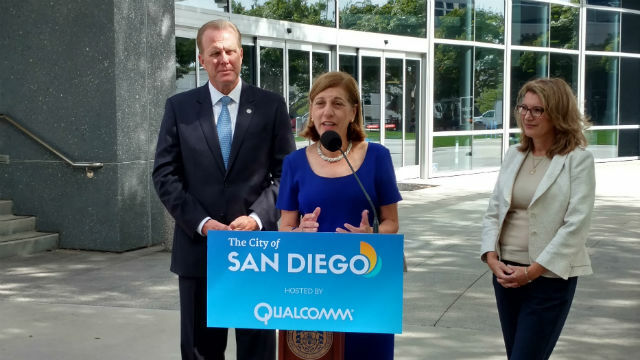 City Councilwoman Barbara Bry said Wednesday that if elected mayor she would apply her experience in the high technology industry to governing San Diego. Bry said her work at ProFlowers and other tech startups taught her how to build a team, meet a budget and create jobs in the innovation economy. “My background is very different from any other current elected official in this area since I’ve spent most of my career as a businesswoman in the tech sector,” she told Times of San Diego. Bry, a Democrat who represents District 1, is the first major candidate to announce a mayoral run. The March 2020 primary is 14 months away. Mayor Kevin Faulconer, a Republican, is in his second and final term. The post is non-partisan, but Democrats hope to win in a city that is trending further to the left. She said taking this vision to every neighborhood will help San Diego develop a workforce fully adapted to the future. Bry, a native of the Philadelphia area, has a masters degree in business from Harvard University. She was a business reporter for The Los Angeles Times before entering the high tech industry. She worked for the CONNECT tech incubator, founded Athena San Diego for women in technology and started Run Women Run to encourage women to enter politics. After her election to the City Council in 2016, she was named the council’s president pro tem in 2017. Others who have been mentioned as potential mayoral candidates include Assemblyman Todd Gloria and Rep. Scott Peters, both Democrats, and on the Republican side, City Councilmen Mark Kersey and Scott Sherman.